It's Thursday! Time for English class! 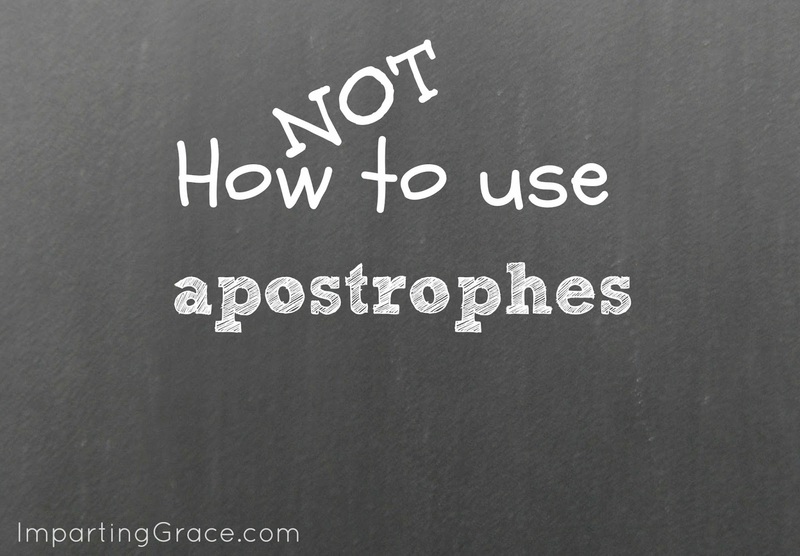 Q: When should you use an apostrophe to form a plural? That's an excellent question. And there's an excellent answer for it. This is one rule I really like, because it's easy to remember. The answer is never. Never. NEVER. You should never use an apostrophe to form the plural of any word. The little boy has lots of toy trucks (NOT truck's). The children are all taking naps (NOT nap's). The Smiths (NOT Smith's) are coming to dinner. Lots (NOT lot's) of kids (NOT kids) are out sick today. Isn't that nice and easy? You NEVER need an apostrophe to form the plural of a word. 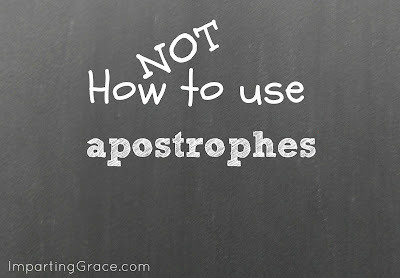 Apostrophes are used only to form possessives and contractions--never plurals. Now, you can use an apostrophe to write the plural of symbols or dates. Example: Back in the 1970's, we were taught to dot our i's and cross our t's. If you're writing something in longhand, this is a very good rule to follow. But with the use of computers, we can easily just place a very small "s" after dates and symbols, so this rule is not nearly so important as it used to be. So that's it! A nice, easy rule to remember. Please let me know if you have any grammar questions or if there's a subject you'd like for me cover in one of these posts. Leave me a comment or email me (RichellaP [at] gmail [dot] com). I'd love to help you if I can! Thank you for posting these little English reminders. It is always easy to forget things and nice to have a refresher. Have a wonderful day! My question goes along with Tobi's. If you are doing a plaque for your house with my last name (Meek -- no "s"). Do you put "The Meeks" showing more than one Meek live there or The Meeks' showing plural Meeks with possessive (apostrophe)as ownership of the house. I have been pondering this one for several days now. Thanks for your help! See, the Smiths are coming to dinner would be the one I always get wrong. Good questions, Tobi and Judy! The names are singular, so to make them plural, you add "es." So the plural of Matthews would be "Matthewes." But that sounds awkward, doesn't it? And the point of grammar is communication, so I don't usually use this kind of plural, even though it's technically correct. Instead, I say "Matthews family." Judy, your house sign should say "The Meeks." BUT, technically, it say "The Meeks' " because there could be the implication of possessiveness--you could be implying that this is "The Meeks' HOUSE." But I think that's a stretch. Again, the point is communication, so I think that implied possessiveness is a bit of a stretch. I think it's better to use the possessive form only when the object of possession is stated. So I say "We're going to the Meeks' house for dinner," but I would say "We're having dinner with the Meeks." Wow...I think that the blog world and posting..throws out a lot of English rules. Okay, Kiddo and I have been writing for the past couple of days during school, but I have one grammar rule that I cannot figure out. I have seen it two different ways, so I want to make sure I'm teaching him the correct way. Here's my sample sentence. Did she call it "a crying shame"? Now, did I use punctuation correctly? Because she didn't ask if it was a crying shame...she called it a crying shame, but the person asking is not sure if that's what she said. I have questions like that about periods and exclamation points, too. Yes, good one! 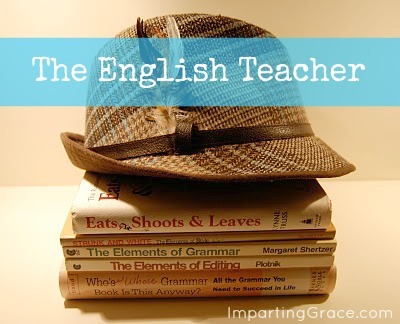 Love these English teacher posts!!! When you get time, please help me with laying, lying, set, sat, etc. I was lying down? I laid it on the table? The book was just laying around? I sat it on the table? I set it on the table? I'll NEVER get it! HELP! She said, "I can't wait to go to the mall!" or should it be...She said, "I can't wait to go to the mall"! I believe I was the one that asked you to address this (maybe not the ONLY one though). And thank you!!! It's a huge pet peeve of mine when people add random apostrophes. Hi, Richella, so happy to hear that you will be at Blissdom. Please give me a big hug! What happens when your last name ends in a "y" and you want to make it plural (i.e., when printing up your Christmas cards). I have seen it both ways: "Kenny's" and "Kennys." Which is correct? Thanks for clarifying this!! Erin, you would simply add an "s" to the end of a name that ends in "y," so the plural of Kenny would be Kennys. That looks a little odd to us because we're accustomed to the spelling rule of changing the "y" to "i" and adding "es." We don't do that with proper names, though; we simply add an "s." An alternative would be simply to write "the Kenny family." Hope this helps! Bless you, bless you, bless you! This is my biggest pet peeve in writing. I see it all the time, even in blogs where the writer is otherwise exceptionally good with communication. I tell my kids (I'm a teacher and a parent)to never, Never, NEVER use an apostrophe to make a plural. I do believe apostophes are the bane of my life: grammatically speaking, of course! Thank you, Thank you, Thank you!!! From one teacher to another- amen sister!! This is one major pet peeve of mine! Plurals and possessives are not the same thing! i need help with semi-colons? i learned not to write alot after reading the linked post below (have you read it, you will think it is funny...did i use my apostrophe correctly? ).